Traditional October seminar organized by the Slovenian Aikikai and led by Wilko Vriesman Sensei was attended by over 70 aikidokas. We learned more about the budo and technical aspects of Aikido and how this knowledge could be integrated in both teaching and learning process. Then there was dan grading where Aleksandr Starovojtov and Dejan Bišćević were promoted to sandan. Peter Fistrovič - to shodan. His Excellency Shigeharu Murayama, Ambassador of Japan to Slovenia, received a delegation of the Slovenian Aikikai Federation and Hombu Dojo Shihan Yukimitsu Kobayashi during the latter's visit to Ljubljana. 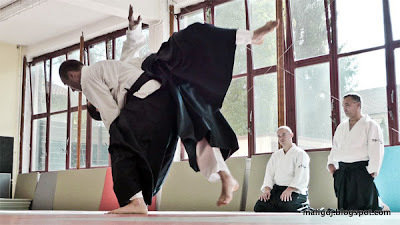 Mr. Murayama stated his intention to provide cultural, media and organizational support of the Slovenian Aikikai Federation, as the umbrella organization for Slovenian Aikido clubs. On March 17, a key event for the Slovenian Aikikai Federation took place - an Aikido seminar led by Hombu Dojo Shihan Yukimitsu Kobayashi and the Federation's technical director, Wilko Vriesman Sensei. This is the second time that Aikikai Hombu Dojo, the Aikido world headquarters, has sent its representative to Slovenia, marking an important step towards official recognition. The seminar, which was held at the Triglav Sports Hall, was attended by almost 100 participants from the Slovenian Aikikai Federation and other Aikido clubs in Slovenia and abroad. The event was covered by the national sports media, including this photo report on Sportal.